130:6.2 The young man was disinclined to talk, and so Jesus made a second approach to his soul, saying: "I understand you come up in these hills to get away from folks; so, of course, you do not want to talk with me, but I would like to know whether you are familiar with these hills; do you know the direction of the trails? and, perchance, could you inform me as to the best route to Phenix?" Now this youth was very familiar with these mountains, and he really became much interested in telling Jesus the way to Phenix, so much so that he marked out all the trails on the ground and fully explained every detail. 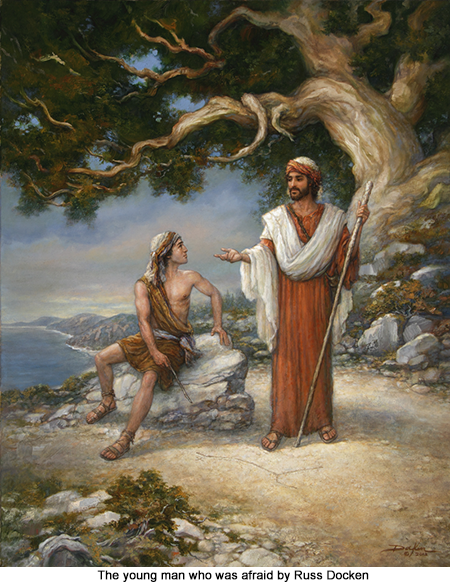 But he was startled and made curious when Jesus, after saying good-bye and making as if he were taking leave, suddenly turned to him, saying: "I well know you wish to be left alone with your disconsolation; but it would be neither kind nor fair for me to receive such generous help from you as to how best to find my way to Phenix and then unthinkingly to go away from you without making the least effort to answer your appealing request for help and guidance regarding the best route to the goal of destiny which you seek in your heart while you tarry here on the mountainside. As you so well know the trails to Phenix, having traversed them many times, so do I well know the way to the city of your disappointed hopes and thwarted ambitions. And since you have asked me for help, I will not disappoint you." The youth was almost overcome, but he managed to stammer out, "But-I did not ask you for anything-" And Jesus, laying a gentle hand on his shoulder, said: "No, son, not with words but with longing looks did you appeal to my heart. My boy, to one who loves his fellows there is an eloquent appeal for help in your countenance of discouragement and despair. Sit down with me while I tell you of the service trails and happiness highways which lead from the sorrows of self to the joys of loving activities in the brotherhood of men and in the service of the God of heaven." 130:6.3 By this time the young man very much desired to talk with Jesus, and he knelt at his feet imploring Jesus to help him, to show him the way of escape from his world of personal sorrow and defeat. Said Jesus: "My friend, arise! Stand up like a man! You may be surrounded with small enemies and be retarded by many obstacles, but the big things and the real things of this world and the universe are on your side. The sun rises every morning to salute you just as it does the most powerful and prosperous man on earth. Look-you have a strong body and powerful muscles-your physical equipment is better than the average. Of course, it is just about useless while you sit out here on the mountainside and grieve over your misfortunes, real and fancied. But you could do great things with your body if you would hasten off to where great things are waiting to be done. You are trying to run away from your unhappy self, but it cannot be done. You and your problems of living are real; you cannot escape them as long as you live. But look again, your mind is clear and capable. Your strong body has an intelligent mind to direct it. Set your mind at work to solve its problems; teach your intellect to work for you; refuse longer to be dominated by fear like an unthinking animal. Your mind should be your courageous ally in the solution of your life problems rather than your being, as you have been, its abject fear-slave and the bond servant of depression and defeat. But most valuable of all, your potential of real achievement is the spirit which lives within you, and which will stimulate and inspire your mind to control itself and activate the body if you will release it from the fetters of fear and thus enable your spiritual nature to begin your deliverance from the evils of inaction by the power-presence of living faith. And then, forthwith, will this faith vanquish fear of men by the compelling presence of that new and all-dominating love of your fellows which will so soon fill your soul to overflowing because of the consciousness which has been born in your heart that you are a child of God. 130:6.4 "This day, my son, you are to be reborn, re-established as a man of faith, courage, and devoted service to man, for God's sake. And when you become so readjusted to life within yourself, you become likewise readjusted to the universe; you have been born again- born of the spirit- and henceforth will your whole life become one of victorious accomplishment. Trouble will invigorate you; disappointment will spur you on; difficulties will challenge you; and obstacles will stimulate you. Arise, young man! Say farewell to the life of cringing fear and fleeing cowardice. Hasten back to duty and live your life in the flesh as a son of God, a mortal dedicated to the ennobling service of man on earth and destined to the superb and eternal service of God in eternity."